Foxconn has a beautiful X58 motherboard full of potential. With some tender loving care, you can take your hardware to levels not seen by many Core i7 motherboards. Excellent packaging and a plethora of accessories help make the BloodRAGE a motherboard to lust after. It is not for the faint at heart, so consider yourself warned! But fear not, for Foxconn is more than willing to help you achieve your overclocking goals. No other color but red can be used to describe what fury would look like. Foxconn did not hold back with this color in designing the board or the box where the BloodRAGE rests, waiting to release its power. The front of the retail packaging explodes in visual stimuli dragging the onlooker’s eyes deep into the world that is the BloodRAGE. A face, man or woman, is pushing through what looks like red latex and seems to be fighting back the craze with untapped ferocity. Foxconn uses a 14 phase hybrid PWM and DirectFET MOFSET power delivery system to help you extract as much potential as you can from your Core i7 CPU. A SONAR X-FI Audio card with Creative X-FI is included to help you fill your room with the sounds of fury. A unique 4-in-1 Quantum Cooling accessory package is included that is eerily similar to what you would find in the BlackOPS packaging. Your options for cooling the NB are a passive heatsink, a fan, a copper water block or a dice/LN2 pot. That’s right, you have the option to go sub-zero cooling on the NB included in the box. And of course, as with most other X58 motherboards on the market, the Blood RAGE supports CrossfireX and SLI technologies. Inside the prison that is the retail package, lay two boxes. The top contains the Blood RAGE. The bottom, the accessories that complete the beast. As our hands shake with anticipation while removing the boxes, we get a faint whiff of brand new silicon. The sharp, sweet smell with a touch of burnt plastic fills our senses and enhances our fury. There are not to many things in the world of computers that are more exciting than new hardware. On top of that, we are now holding one of the most sought after motherboards in the X58 overclocking community. Still shaking, but needing to move on, we take a look at the accessories included in the second box. Doing so allows our blood pressure to settle and the tremors to ease. Inside the accessories package we find many items, some necessary, some included just because. There is a fan for mounting on the NB, along with the necessary hardware to mount the water block. A single SLI cable is thrown in as well as the SONAR X-FI audio card. There are a number of SATA cables and SATA adapter cables included. Looking around some more we find the manual and a DVD containing drivers and programs. Foxconn was kind enough to include a huge poster of easy-to-follow installation instructions. Obviously this was done to help those shaking from anticipation and boiling with maddness waiting to throw the awesomeness of the Blood RAGE into their cases and themselves into overclocking history. There it is, sitting in all its glory. Pulsating with power. Waiting for us to lock in a Core i7 and throw on a bunch of gpu horsepower. Beautiful. That’s all we can say as we stare speechless. The layout of the Blood RAGE seems to have been engineered by gods. The CPU socket area includes the usual S1366 mounting holes, but was that enough? No! There are holes for S775 coolers as well. The extra holes are limited, though, by the large backplate that is used to secure the CPU hold down bracket. Without it, we are sure that a Core i7 processor would just break lose of its bonds and try to run away from the ferociousness of the Blood RAGE. Six SATA ports with two additional SAS/SATA connectors hang on the outer edge of the lower part of the Blood RAGE. Upon closer inspection we noticed that the engineering gods at Foxconn included some handy bits on the Blood RAGE. Crafted to make an overclocker’s life easier is the inclusion of a battery discharge jumper. No longer do you need to remove the battery to completely discharge the motherboard. Located in the vicinity of the DIMM slots is a jumper that lets you choose to enable/disable the Clear CMOS button on the I/O panel. Located north of the Button_EN jumper is the BIOS Select jumper. Adjacent to the DIMM slots is the almighty Force Reset button. Yep, that’s right, if your system hangs on reboot after attempting some seriously crazy OC settings, just push this button to force the motherboard to reset and load values that allow you to get back into the BIOS. As an added convenience and a true headache reliever, Reset/Power buttons are located on the bottom of the motherboard. But that’s not all! In order to accurately test the voltages of the CPU, memory, etc., Foxconn made sure there were voltage readout points located at the top of the motherboard above the DIMM slots. The BIOS of any motherboard can be a complicated and unfamiliar thing to any level of PC user. Foxconn’s Phoenix – AwardBIOS used for the Blood RAGE is no different. At times, you’ll want to pull your hair trying to figure out what settings to change just to get a few more megahertz out of your CPU. We mention any level of PC user for a few reasons. Each motherboard manufacturer uses a different BIOS for the boards they create. To an experienced user, some of the settings will feel familiar, some will look alien. The verbage used to describe the different settings in BIOS varies among manufacturers as much as the designs of their flagship products. To make things less complicated, we’ll be taking you through a detailed look at the most critical BIOS settings when you are considering overclocking. We need to let you know now, though, that this mini guide is designed for the Blood RAGE only and the actual screens and some of the settings you see here are likely to change with future BIOS updates. We will include those in the overclocking thread that will accompany this article in the near future. We start our trek with the Quantum BIOS screen. This page is the starting point to all your overclocking settings within the Blood RAGE BIOS. CPU Features, Memory Settings, All Voltage Settings and OC Gear will be explained in detail after we finish up with the settings that can be changed on the Quantum BIOS screen. We’ll start with CPU Turbo. You have three options to choose from: Disabled, Always On or Enabled. Disabled is self explanatory and renders CPU Turbo inactive. Before we get to the other options, let us talk about what CPU Turbo is. In short, CPU Turbo allows the processor multiplier to increase by one or more when the setting is Enabled. There are certain CPU workload requirements that must be met for one or all four of the processor cores to increase the multiplier. These requirements deal with the number of cores, power consumption and CPU temperature. Once any of these requirements are out of spec, the processor frequency is set back to the original settings within the BIOS. In other words, if you have your CPU multiplier set to 20, CPU Turbo, or Turbo Boost as coined by Intel, will increase that number to 21 and in some cases 22 depending on the workload or demand of the Operating System. Once that speed is no longer needed, or the maximum thermal processor temperature is reached, the multiplier reverts to its previous setting. In order to get around the multiplier reverting back to the BIOS setting, the Always On option needs to be selected. What this setting means is that the Turbo Boost, or CPU Turbo, will continually run at a +1 or +2 multiplier no matter what state or load the processor is in. This setting comes in handy when dealing with a Core i7 920 or 940 CPU, as their multipliers are locked at 20 and 22 respectively. Having a higher multiplier allows you to reach a higher CPU frequency. For more information on Turbo Boost Technology, follow this link. Moving on to the next setting, we have System Turbo. This setting, once enabled, allows you to adjust the numerous voltage and CPU settings contained on the Quantum BIOS page and the All Voltage Settings section. Under the Clock Speed Control Center is where the fun really begins. To start, we have the CPU Bclock (FSB) setting. FSB is used only to help make this setting more recognizeable. Core i7 processors no longer use FSB, they use QPI(Quick Path Interconnect). The Bclock is used in the same manner and adjusting this setting results in a change in processor frequency and memory speeds. The QPI Link Fast Mode allows you to enable or disable this setting. QPI Muliplier allows you to select the multiplier used in determining the speed of the QPI frequency. You have three options that change the frequency based on how high or low you set the Bclock. The higher the QPI frequency, the more likely the system will be unstable. Obviously, QPI Target Speed displays what the QPI frequency will be based on the multiplier and Bclock used. CPU Core Multiplier is used to determine what speed, when multiplied by the Bclock, the processor frequency will run at. Once again, on Core i7 920 and 940 processors the multiplier is locked at 20 and 22. However, you can adjust the multiplier down and you can increase the multiplier with the help of Turbo boost, or CPU Turbo. The Blood RAGE BIOS is kind enough to show you what the resultant CPU frequency will be with the CPU Target Speed. This is a very useful setting and saves time from having to work out the frequency in your head, on paper or with a calculator. The CPU Uncore Multiplier is just that, a multiplier used to determine the CPU Uncore frequency. Uncore is essentially all the elements in the processor die that are not computing engines. When overclocking, Uncore has to be greater than or equal to twice the memory frequency. Most motherboard BIOSes adjust for this, but it is always a good thing to check your settings. Again, CPU Uncore Target Speed is a look at what the resultant Uncore frequency will be based on the other CPU settings that have been changed, i.e, CPU Bclock and memory frequencies. The Memory Bus Multiplier is similar to the other multipliers in that it is used to determine memory frequencies. What’s different about it is the way it is displayed and the options you have to choose from. A typical Memory Bus Multiplier is displayed as a ratio of CPU Bclock to memory frequency. The options are listed as 2/8, 2/10, 2/12 and so on. How you determine the memory frequency is by using the second part of the ratio, for example, in the 2/10 setting you would use 10*Bclock to figure out what the memory speeds will be. So, if we take the example ratio of 2/10, 10 being the number we want, and multiply it by a Bclock of 133MHz, we end up with a memory frequency of 1333MHz. You must also realize that when looking at the memory frequency in the CPUz memory tab, you will see half of what the true value is. In our example, a memory frequency of 1333MHz will show up as 667MHz in CPUz. That is because we are dealing with Dual Data Rate(DDR) memory and the frequency we see in CPUz is double to get the effective speed. Once again, the Blood RAGE is nice enough to give us a Memory Bus Target Speed that automatically adjusts on the fly when you change settings in the bios that effect it such as Bclock and Memory Bus Multiplier. CPU and IOH Clock Skew allow you to adjust the phase of the CPU and IOH respectively. It is possible that adjusting these two settings could allow for more stable or higher overclocking. Coming up we’ll be covering the CPU Features page along with the Memory Settings section of the Blood RAGE BIOS. Here we have the CPU Features menu. This is the place where we can enable/disable settings related exclusively to the processor. To start with we have PPM. Processor Power Management, or PPM, has two easy settings, as do most on this page, Enable or Disable. PPM, along with EIST and CxE, is part of Intel’s SpeedStep technology. 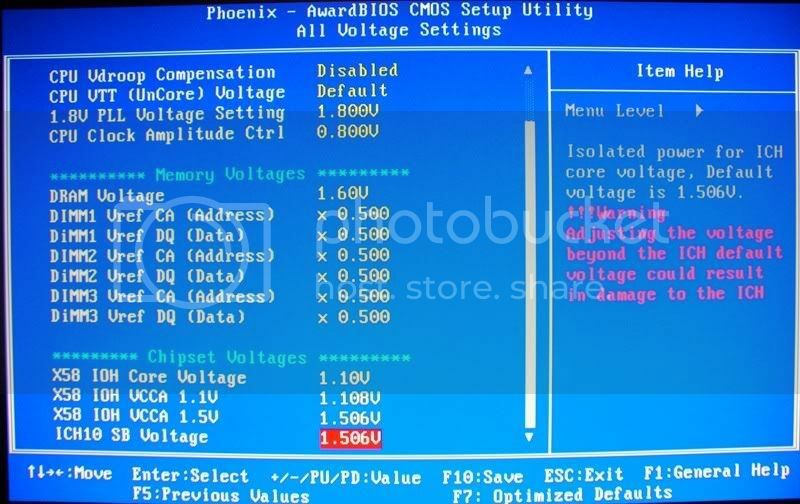 Enabling PPM allows you to adjust EIST and CxE settings as well as CPU Turbo on the Quantum BIOS menu page. EIST, or Enhanced SpeedStep Technology, allows the processor to fluctuate the speeds at which it runs based on the workload and operating environment. This setting can be Enabled or Disabled based on user needs. Leaving EIST enabled allows you to set the CPU Turbo, or Turbo Boost, to its available options on the Quantum BIOS menu page. CxE is an enhanced halt state that allows the processor to reduce power consumption when idle or not in use. You can select from a list of CxE states selecting the one that is compatible with your processor and motherboard. The options under this setting are: Auto, Disable, C1, C1E, C3 and C6. When overclocking, you want this option disabled. After finding an overclock setting that works for your setup, you may want to set this option to Auto to conserve power when your system is not in use. The Execute Disable Bit settings are Enabled/Disabled and when overclocking, we recommend Disabling this option. It is ok to leave it enabled as disabling it has not proven to help overclocking in any way. Execute Disable Bit can be used to prevent malicious buffer overflow attacks when combined with a supporting operating system and is generally used in a server or workstatein environment. As with Execute Disable Bit, enabling or disabling Virtualization has no noticeable affect on overclocking. Virtualization allows users to run multiple environments, or operating systems, for example, on a single machine. Hyperthreading has made a come back in Intel processors. This time around, we see the advantage of this feature in multithreaded applications and cpu intensive situations. Your options are to Enable or Disable Hyperthreading. Disabling Hyperthreading has its advantages when overclocking above a certain frequency. In our testing, disabling this option allowed us to remain stable at considerably higher frequencies than with it enabled. Active Processor Cores allows you to choose the number of cores to be active within your processor. Disabling core(s) can sometimes lead to higher overall clock speeds, but is generally used when benchmarking at extremely high cpu speeds under subzero cooling. You may be able to reach higher frequencies with two or three cores disabled for single threaded benchmarks such as SuperPi or Pifast. TDC and TDP limit deal with CPU Turbo(Turbo Boost) Current and Power respectively. Enabling these two options allows you to adjust the Current TDC/TDP Limits. These settings can help remove the processor thresholds that allow Turbo Boost to kick in, essentially allowing you the option of leaving CPU Turbo always on. The Memory Settings menu is probably the most intimidating as its settings can sometimes baffle the most seasoned overclockers. This page has a lot of settings but still is short compared to some memory menus we’ve seen. 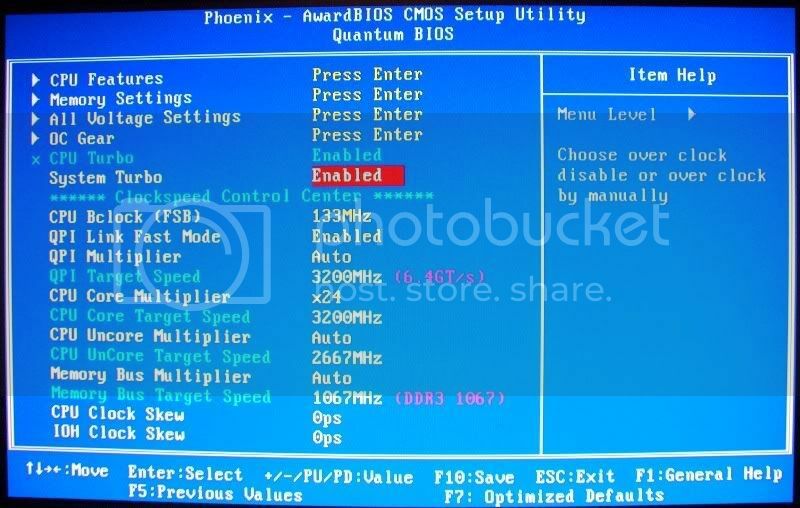 Remember, to be able to change the settings under Memory Timings, you must enable System Turbo on the Quantum BIOS screen. The IMC Configuration allows you to adjust the settings directly below it and above the Memory Timings section. Your options are to Enable or Disable this setting. We recommend you enable it so you can adjust the other configurations if needed. Channel Configuration, Channel Interleaving and Rank Interleaving can generally be left alone. Changing the Channel or Rank Interleaving may provide a more stable memory overclock based in the amount of RAM used, 3GB vs. 6GB, or the type of Windows operating system used, 32-bit vs. 64-bit. Now, on to the good stuff. But don’t worry, most of what’s listed in the Memory Timings section can and will be left on Auto. DRAM Timing Control is a setting that sets the RAM frequency to those selected by the manufacturer. Often times, the settings you find under here do not match those of the memory you have installed on your motherboard. For overclocking and general purposes, we recommend Disabling this setting so you have more control over the pertinent memory timings. tCL (CAS Latency), tRCD (RAS to CAS Delay), tRP (RAS Percentage), tRAS (Percentage Delay) and CR (Command Rate) are the timings you will want to manually adjust according to those set by the manufacturer of the memory you are running in your system. For example, we had to manually set the timings for the G.Skill Pi Black DDR3 2000MHz triple channel kit to 9-9-9-24 1T respectively. We also adjusted the DRAM voltage which we will get to in a bit. Now, these settings mentioned can be adjust up or down depending on if you are looking to bench with tighter timings or higher overall memory frequencies. Only when you are gunning for the max possible memory frequency you can get on your kit will you need to adjust the other settings not covered above, but available in the Memory Timings section of the Memory Settings menu. 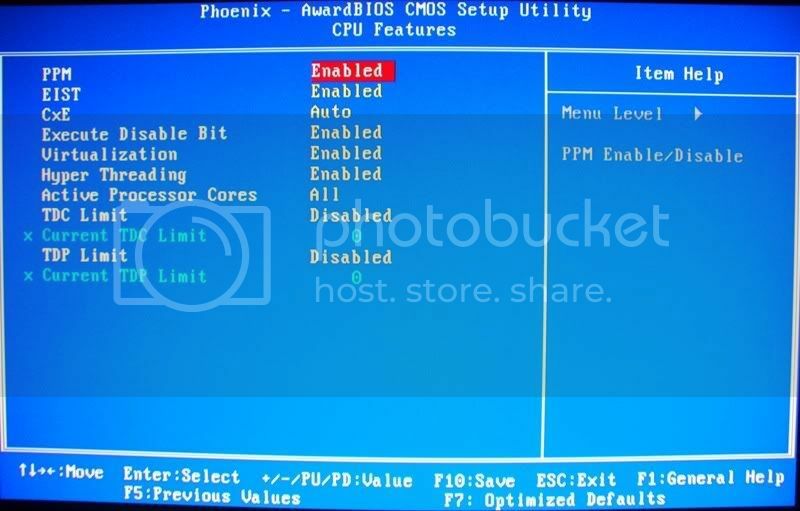 Remember, the BIOS is a dynamic piece of software and the number of settings available could change with future BIOS updates. On the next page we cover the last few things that are most important in an overclocker’s BIOS tweaking arsenal. In the final page of our Blood RAGE BIOS coverage, we start with the All Voltage Settings menu. In the above screenshots you will see all the settings Foxconn has made available to adjust about everything that has a current running through it. The first setting we run into is the CPU Core Voltage. Directly underneath that is the CPU Target Core Voltage which shows you what the resultant voltage will be after increasing the CPU Core Voltage setting. 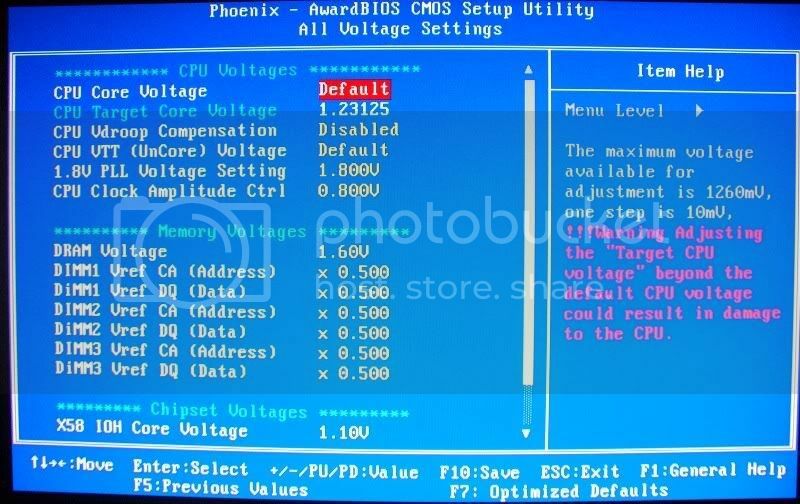 This setting increases the CPU Core Voltage by 10mV increments from the base CPU Voltage that the BIOS reads from the CPU. In this instance, the starting voltage is 1.23125V. Your results may vary. You are allowed to increase the core voltage up to a +1260mV which roughly yields a CPU Voltage of 2.5V. Unless you are doing some subzero testing, you will never and should never come close to this maximum setting. For air and water cooling, a max of approx. 1.65V is all that is needed. You will not generally see an advantage going any higher without the help of additional cooling. CPU Vdroop Compensation, or Load Line Calibration(LLC), is a setting that Disables or Enables, well, LLC. Enabling CPU Vdroop Compensation ‘locks’ the CPU Core Voltage at the setting you select in the BIOS. Under normal operation, i.e., Disabled, LLC allows the CPU Core Voltage to flucuate depending on load. There is a debate on whether or not this setting helps or hinders your overclocking. Our advice is to try it out under both settings. We have generally seen less voltage needed when CPU Vdroop Compensation is Enabled, but this could lead to long term system instability. For short benchmark runs, or a bit longer ones, go ahead and Enable it. You might find that it helps you acheive a higher stable overclock at a lesser than expected CPU Voltage. CPU VTT (Uncore) Voltage plays an important role in maintaining a higher stable Bclock. This setting is adjusted in 10mV increments. As an example, if you are shooting for a 200MHz Bclock, we needed an increase in +360mV to get it stable. In addition to the CPU VTT, you will need to adjust the X58 IOH Core Voltage located a bit further down the page to around 1.25V to acheive stability at a 200MHz Bclock. For lower or higher Bclock speeds, you will need to adjust each one of these settings accordingly. The 1.8V PLL Voltage Setting can basically be ignored for any type of overclocking you plan on doing up until you hit subzero territory. Increasing this voltage had no affect on our benchmarking stability. CPU Clock Amplitude Ctrl is another setting that may or may not help you reach a higher overclock. You can mess around with the different settings available to see if any will help with your results. DRAM Voltage is the most important setting in this section of the All Voltages Settings menu. Most triple channel memory kits are set at a default voltage of 1.65V. We recommend you manually set this voltage to what is stated on your triple channel memory kit. The other DIMM voltage adjustments in this section may help when shooting for a very high memory overclock. Last but not least in the All Voltage Settings menu is the Chipset Voltages section. The most important voltage setting in this section is the X58 IOH Core Voltage setting. Adjusting this voltage along with the CPU VTT (Uncore) Voltage from the CPU Voltage section will allow you to hit higher Bclocks. As an example, if you are trying for a Bclock of 200MHz, set this voltage to at least 1.25v for a stable processor speed. The X58 IOH VCCA 1.1V and 1.5V are similar in respect to the CPU VTT and PLL voltages. Adjusting these may or may not help with hitting higher overclocks. The ICH10 SB Voltage can be left alone. Adjusting this setting may help in maintaining a higher PCI-e frequency but is not needed for a better CPU speed. Remember, we covered the BIOS menus that are related to system overclocking in our BIOS sections. The rest of the BIOS settings such as RAID, boot disks, etc., can be found in the Blood RAGE Motherboard User’s Manual. Next up we’ll take a look at how to install the NB heatsink fan and the water block. As an added bonus Foxconn has included some very sleek extras with the Blood RAGE. One of these ‘extras’ is more of a requirement if you plan on overclocking your processor. The North Bridge, or IOH, gets rather warm and toasty on its own, especially if you increase the Uncore voltages/frequencies when overclocking. To help alleviate this temperature problem, Foxconn has provided you with a small 40mm fan to mount on the heatsink. You can see the fan and the fan clips in the picture below. In order to install the fan, we recommend removing the heatsink from the IOH first and cleaning off the TIM left behind. To remove the heatsink, unscrew the four hold down screws located around the heatsink as seen in the following picture. With the heatsink removed, we can see the TIM underneath. Looks like a better application of some Ceramique will be more affective. Clean the TIM using some Isopropyl Alcohol that is at least 91%. The first thing to do is attach the fan clips to the heatsink. Once the fan is installed on the heatsink, apply a pea sized amount of TIM and reinstall the heatsink. Installing the water block is done in the same way as the heatsink minus the fan of course. On the bottom of the water block is a clear piece of plastic used to protect the copper bottom. Make sure you remove this before attaching the block to the IOH. That’s it for attaching the fan and water block. Foxconn also includes an IOH dry ice/LN2 tube that is attached in the same manner as the water block. This is used for extreme overclocking only. For more information on the tube, consult the manual. After a long introduction to some of the key features of the Blood RAGE, we come to the ever popular testing part of our review. Up next is our testing methodology and test setup used. In order to test the hardware you need to run some benchmarks. For all games tested today we will be running them at a screen resolution of 1680×1050, 1920×1200 and 2560×1600. We’ve upgraded our testing monitor to a 30" for this review. With the addition of higher resolutions, we’ll be able to report more accurate and complete benchmark results for gaming and synthetic graphics benchmarks used. Since the Blood RAGE is the first board in our new testing suite, we will be comparing it to the Classified. The next board, and future boards we use, will be compared to the Blood RAGE as it will be our base motherboard for comparison results. The next motherboard in our lineup is the eVGA X58 3X SLI Classified. Enough with the small talk! Up next, results!!! Armed with a can of Venom Mojave Rattler energy drink, we start our results session with some familiar graphics benchmarking programs. Futuremark’s 3DMark Vantage and 3DMark06 are the most up to date synthetic graphics card benchmarks. You will always find a pro bencher trying to break one of these records with an insane LN2 setup. Unfortunately, we have not graduated to LN2, yet, but future plans include some subzero benchmark sessions. We really worked ourselves into a frenzy at the beginning of this review. But who can blame us with such an awesome and infuriating motherboard! Some details about our anger sessions will be revealed in the overclocking section. For now, we can be at peace with the overclocking gods and report our findings. To start our tantric meditation session, we’ll begin with 3DMark06. We had orginally planned to publish our review of the Blood RAGE without a comparison motherboard. Trying to come up with a decent review without comparison results does not work so well. In the interest of our readers, we decided to hold off on this review until we could compare it to a formidable foe. That foe is the eVGA X58 3X SLI Classified. The Classified uses the nf200 chip to provide 4 PCIe x16 slots and adds in some latency for games and other graphical programs/benchmarks. As we can see from the graph above, the Blood RAGE edges out the Classified in both CPU Score(higher is better) and overall score(higher is better). 3DMark Vantage shows similar results as 3DMark06. The Blood RAGE benefits from no added latency due to the nf200 chip. You would expect, from eVGA’s claim of 3x more gold in the socket area, that the Classified would score higher than the Blood RAGE, or at least even, in the CPU tests. Of course, the gold in the socket area is to provide lower impedance and allow cleaner power delivery to the CPU, but that should lead to better CPU performance along with an overall better stable system. The first game we chose to benchmark was UT3 Black Edition that has the new Titan Expansion pak. UT3 is getting older, but is still a great game to test out on new graphics hardware because it looks great and runs on just about every card with max settings. As a side note, we used the UT3 Benchtool with maxed out settings. The Biohazard Bot level was used and each resolution was run three times. We took the three results and used the average from those in the graphs below. Once again, our results are what we expected. The Blood RAGE benefits from no latency due to the nf200 chip and our overall framerates at all resolutions tested are higher. Now, any framerate above 60fps is not noticeable by the average human eye, so with UT3 running at such high framerates on both systems, you will not see a difference. To round out our graphics testing for this review we chose to use a really graphic intensive game, Crysis Warhead. Some say the coding is terrible in this game, but regardless, it still stresses the gpu’s and is a great tool to have in our benchmark arsenal. Crysis Warhead was run at max in game settings(enthusiast) with no AA at each resolution. The results in this case are dead even without a clear winner. With framerates so low, the latency caused by the nf200 chip is less evident. The Blood RAGE still performs admirably for a board that can be found for 2/3 the cost of the Classified. That ends our graphics testing for this review. While some results were close, we must give the Blood RAGE the win here. Price/performance is still a big concern for most buyers out there, and so far, it is clear that the Blood RAGE is the leader between these two motherboards. To start off our CPU and memory results testing, we begin with Cinebench R10 64bit. The tests we are using in this benchmark are the 1 CPU and x CPU tests which stress the CPU while rendering an image at an 800×640 resolution. The 1 CPU tests uses one processor or thread, while the x CPU test uses the maximum available processors/threads. In this case, 8 threads is the max with the Core i7 and HyperThreading. While we are examining CPU performance in this test, we also took a look at how CPU speed, memory speed and timings affect our results. As you can see, there is not a significant difference among the same CPU speeds with an increase in memory speed and lower latency. In fact, when looking at a CPU speed of 3.2GHz, the Blood RAGE and Classified boards do worse with faster memory and lower latencies. Again, it’s not significant enough to impact system performance, but worth noting. Next we take a look at how Fritz Chess benchmarking tool fairs on the Blood RAGE. Fritz Chess uses a P3 1GHz processor as the base for this test. Relative speed is 0 for the P3 1GHz CPU and it does 480 kilo nodes/s. Our results are a direct comparison to this CPU. Looking at relative speed first, we see that at 2.67GHz is basically the same for each motherboard. The Blood RAGE and Classified do the same in the kilo nodes/s test as well. Where we do see a difference is in the 3.2GHz tests. The Blood RAGE is able to pull ahead of the Classified by a narrow margin. Sisoft Sandra Lite 2009 has three tests that we used in our testing. The Arithmetic test shows how the CPU handles arithmetic and floating point instructions while the Multimedia test shows how the processor handles multimedia and data instructions. The Multicore Efficiency test shows how the CPU does with inter-core bandwidth and latency. We used two different CPU speeds, 2.67 and 3.2GHz, along with two different memory speeds and timings to see how the motherboards handle each. What is interesting here is that the Blood RAGE does not care what memory speed or timings we used, but the Classified preferred higer memory speeds with lower latencies at each CPU speed. The Blood RAGE was the overall victor in both the Arithmetic and Multimedia test results as well as in the inter-core bandwidth and latency tests. Up next we take a look at SuperPi 1M and wPrime 32M. While these tests are generally used in the competitive benchmarking world, we felt their results will give those looking to choose a motherboard for some world records an idea on which board to go with. What’s obvious from these results is that lower latency and higher memory speeds results in faster times. Now, the times are extremely close, and for general review results considered even, but when doing competitive benchmarking, those small fractions of times make all the difference. Once again, the Blood RAGE is able to lead the Classified in all results. Last, but certainly not least, is memory bandwidth and latency using Everest Cache and Memory Benchmark tool. We will be looking at the memory results only in this review. The Read results show us what we would expect from higher memory speeds and tighter timings. You see a significant increase in read bandwidth at both speeds by going from 1600MHz and CL8 to 1867MHz and CL7. Once again, the Blood RAGE offers better performance overall at these settings. The Write results are even more impressive for the Blood RAGE as we see a significant increase in bandwidth compared to the Classified. As with the Read and Write tests, the Copy test favors the Blood RAGE with even more of an increase over the Classified. The Latency continues the trend, however the results are closer. What these tests show us is that Foxconn’s reason for using three slots and concentrating on memory performance paid off. Although real world results show little gain in increased memory bandwidth and lower latencies, benchmarkers can see a real benefit with choosing the Blood RAGE over the Classified. With our testing done, we move on to our overclocking section. Fortunately for some, the makers of their boards are more than willing to help guide them through their struggles. Foxconn is one such company that is dedicated to helping out its customers. The Blood RAGE BIOS has been plagued with bugs that can make some go crazy. At stock, everything is calm and peaceful, but when you want to push your CPU to its limits, you may find yourself entangled in a web of mystery. Through all the headaches we have gone through sorting out why our mobo’s BIOS wasn’t cooperating, Foxconn has been there to help with settings and testing our CPU date codes for issues within the BIOS. It has been here, in the overclocking experiences with the Blood RAGE, that our true fury has been unleashed. Sometimes, not in a good way. As we mentioned in the first page of this review, the Blood RAGE is not for those that are easily enraged. If you have high blood pressure, we recommend that you try not to overclock on this board. With that being said, we were happy with the results that we finally acheived. Was the near fatal experience suffered from cardiac arrest worth the hassle with this motherboard? All we have to say is yes. Read on and find out why. With the BIOS updated to latest and greatest, we can move on to the real important overclocking stuff. So you want to hit 4GHz with your i7 920? Whether it be the crazy new D0 stepping or the old school C0, this goal is relatively easy on the Blood RAGE. If you have a C0/C1 processor, the vCore used will depend on the batch number of your cpu. Doing a quick google search will tell you if you have a processor that needs little vCore, or one that may need a significant boost to hit 4GHz. Either way, this quick BIOS guide will steer you in the right direction. To start, let’s look at the most important part of the Blood RAGE’s BIOS, the Quantum BIOS section. The first setting we need to adjust on this page is the System Turbo setting. System Turbo needs to be enabled in order to access all the important settings needed to adjust for 4GHz. Once that’s enabled, we get access to the settings under the Clockspeed Control Center. Our first adjustment is to raise the CPU Bclock (FSB) from 133MHz to 200MHz. At this point everything else in this section can be left alone. Next, let’s navigate to the CPU Features menu. Under this menu we want to disable PPM which will render EIST and CxE disabled as well. As of right now, we don’t need Turbo Mode/Boost enabled, so these settings can be turned off. You can also disable Execute Disable Bit and Virtualization. Doing so doesn’t really impact overclocking performance, but it doesn’t hurt anything, either. Not seen on this menu but included in the latest P07 BIOS is a setting called Current Feedback Override that you need to enable as well. The last menu we want to look at right now is the All Voltage Settings menu. Under the CPU Voltages section we want to adjust the vCore to at least 1.42v for starters. We can adjust this up or down depending on our reboot and whether or not the settings we made pass the post process. The next setting we need to adjust is the CPU VTT (Uncore) Voltage. This voltage helps stabilize our overclock at higher Bclocks. It is adjustable in increments of +10mV and you need to set it at +350/360mV. We can leave the memory timings alone for now as they should be well below default settings. The last voltage we need to adjust is the X58 IOH Core Voltage. Set this to at least 1.24v for the Bclock we are using. Okay! That’s it! Like we mentioned earlier, you may have to adjust the CPU vCore up or down depending on the stepping and batch number of your Core i7 920. If you have any questions, or need help, don’t hesitate to post them in the thread on the bottom of the conclusions page. Armed with an i7 920 D0, we wanted to show you what we could do without the need for subzero cooling. As a teaser, here is a memory result. We will be offering a memory tunning guide for the Blood RAGE in our forums. Be sure to check it out! Effective memory rate is 2235Mhz at 7-8-7-20 timings. Next up is the final words on the Blood RAGE. It has been a long journey with the Foxconn Blood RAGE. At times it seemed like we were going to rip our hair out. The reason we felt it necessary to defile ourselves is because you need to understand the BIOS completely before you can become one with the fury inside. We discovered that through countless hours of messing with settings, the best way to learn is to figure it out yourself… until you want to jump off a bridge, then you go ask the manufacturer for some guidance. After conversing with the great people at Foxconn, we were able to work through our bumps and hiccups. What we were left with is a solid board with looks that could kill. The pure fact that this board is pretty to look at is enough for some to buy it. And we can now say that we recommend this board with really high marks in functionality and looks. You may need some assistance along the way, but that’s what XCPUS.com is here for! We have a thread designated to the Blood RAGE that will help you reach your overclocking goals. We have spent weeks working with the Blood RAGE and can say that it is a solid piece of PCB. It handles memory very well. Dual GTX 295’s are no match for this board. What we could see as far as an improvement, is a better PCIe layout design. Something similar to what the Classified offers or even the ASRock X58 SuperComputer would make this motherboard absolutely perfect. Some may see the three DIMM slots as a disadvantage, but unless you really need more than 12GB’s of RAM via 4GB sticks, then there should be no problems. The Blood RAGE was built for speed and overclocking. It certainly holds its end of the bargain, the rest is up to you.